OpenSimulator is an open source multi-user 3D Application Server. It can be used to create a virtual environment (or world) which can be accessed through a variety of clients, on multiple protocols. OpenSimulator allows you to develop your environment using the technologies you feel work best - we've designed the software to be easily extensible through [[Getting Started with Region Modules|loadable modules]] in order to build custom applications. OpenSimulator is released under a [[BSD License]], a commercially friendly license to embed OpenSimulator in products. 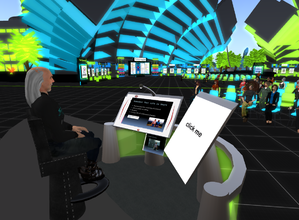 Out of the box, OpenSimulator can be used to simulate a virtual environment similar to Second Life™, given that it supports the SL client protocol. Other environments, protocols and features are supported via add on modules. OpenSimulator is getting more stable as it approaches release 1.0, but we still consider it '''alpha software'''; so should you. * Provides unlimited ability to customize virtual world applications through the use of [[Getting Started with Region Modules|plugin modules]]. Or you could [[Download]] and run a simple standalone OpenSim on your Windows, Linux or Mac desktop to create and preview content.